Winterizing fire sprinkler systems is a critical service needed to reduce the chance of issues associated with damage to piping caused by freezing. Without checking your system, cold weather can cause your fire protection system to cease to function – or worse, burst! FLSA suggests inspecting and testing wet, dry, and antifreeze sprinkler systems before the onset of cold weather. Take the time to inspect your sprinkler systems for the following items. 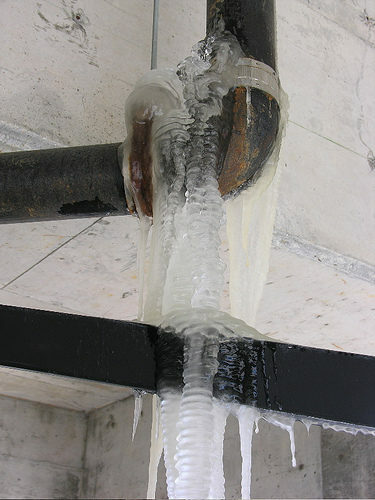 Many wet sprinkler systems prevent pipes freezing by adding an antifreeze solution to the system. Check the antifreeze systems by testing the concentration of the antifreeze solution. If necessary, adjust the level of antifreeze solution in the systems to prevent freezing. When dealing with anti-freeze systems, reference (NFPA 25, Section 5.3.3) for additional information. When Should I Inspect My Sprinkler System? It is important to visually inspect your fire sprinkler system before the onset of cold weather and periodically throughout the winter. After winterizing your system, check routinely for leaks, corrosion, or anything that appears out of the ordinary with your system. I Live in a Warm Climate – Do I Need to Winterize My System? FLSA recommends checking your fire sprinkler system before the winter, even if your location experiences mild winters. In fact, many times buildings in warmer climates are even more vulnerable to freezing because insulating measures are ignored. Without inspecting your system, it can be difficult to properly prepare for the onset of cold weather and whether or not your system is ready. Even one cold snap can bring a system to the breaking point if it has not been properly winterized. FLSA may provide winterization services as a standalone service call or as a part of annual and/or quarterly inspection services agreement. Winterization should always be performed prior to the on-set of cold weather and may be performed by the customer (owner) or by FLSA Technicians or Inspectors. NFPA 25 establishes the responsibility for fire sprinkler system inspection, testing and maintenance as the owner’s responsibility. As part of the inspection, FLSA clearly communicates the customer’s obligation to check all items on the checklist throughout the cold months. Think you’re prepared to winterize your own fire sprinkler system? Feel free to download our easily-printable checklist on how to winterize your fire sprinkler system. If you don’t feel comfortable winterizing your fire protection system, or if you have any questions contact FLSA.